Though the Forties will always be my decade of choice when it comes to fashion, vehicles, and almost everything else, I appreciate their predecessor nearly as much. I don’t like to dwell on the Great Depression or the rise of Hitler when I think of the ’30s- to me they were a decade of glamour and carefree living. I admit, my view of the decade has probably been greatly influenced by watching Jeeves and Wooster throughout my childhood! The following is an afternoon outfit, perfect for tea in the garden and perhaps a spot of croquet; and its sophistication matches the ’30s perfectly. After a wonderful and action-packed trip to London, I’m now back at home and have had a few days to upload my photos and collect my thoughts! I miss England already, and I’m looking forward to sharing the memories of my trip with you over the coming weeks. 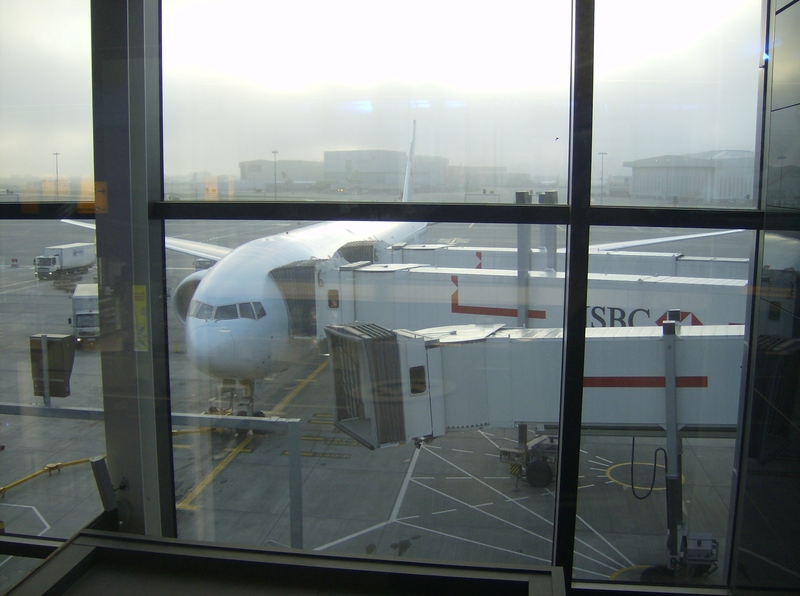 My mum and I arrived at Heathrow early in the morning- I’m not sure exactly what time we arrived, since I didn’t sleep at all on the plane and I hadn’t drunk any coffee for over 10 hours! Once in central London however, the beautiful morning sunshine and an espresso woke me up sufficiently. From Westminster, we took our customary boat ride down the Thames to Greenwich. The voyage is always restful and interesting, and even though I’d taken it twice before, there seemed to be new sights waiting for me this time. 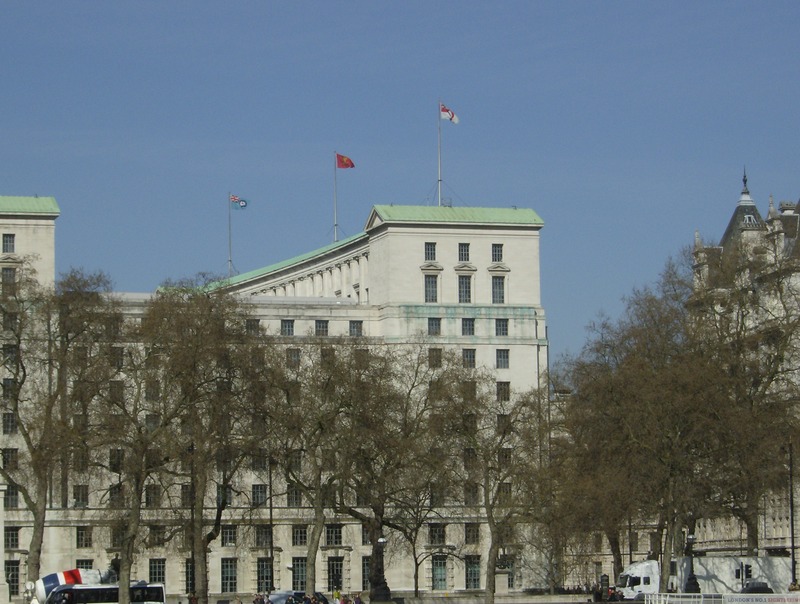 The flags of the RAF, British Army, and Royal Navy were flying atop this building- and I’d never noticed them before! Conversely, lots of familiar sights awaited me in Greenwich. Greenwich is one of my favourite parts of Greater London, and I love its links to Britain’s naval history. I always feel tranquil and at home once I get to Greenwich. 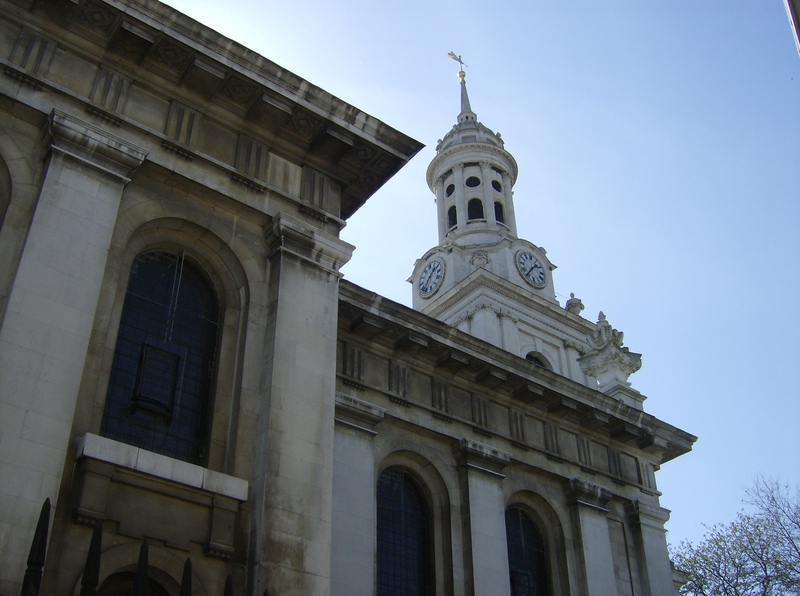 Near the classical façade of what used to be the Royal Naval College rises another classical building: St. Alfege Church. Even apart from the unusual name, this is a distinctive church. 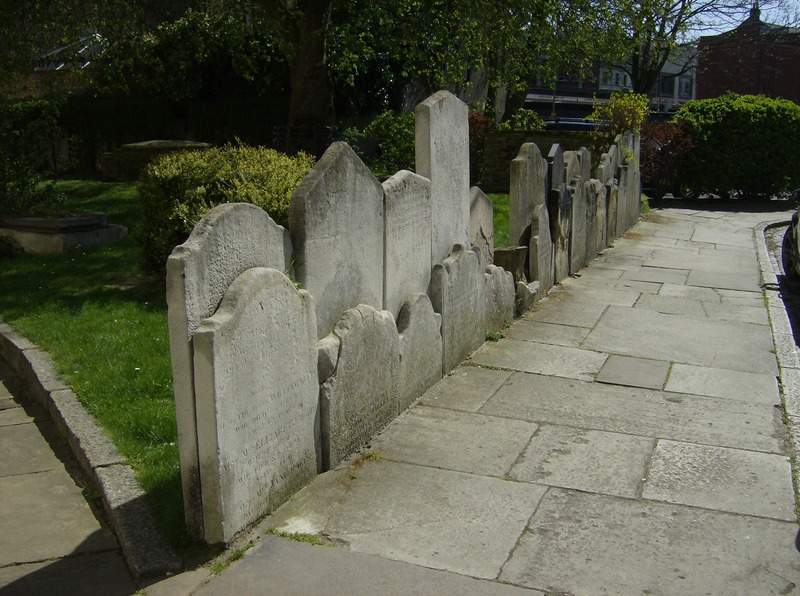 The exterior is surrounded by headstones which seem to have been moved in order to make room for new roads and buildings; and the architecture is similar in style to that of the Naval College buildings only a few moments away. 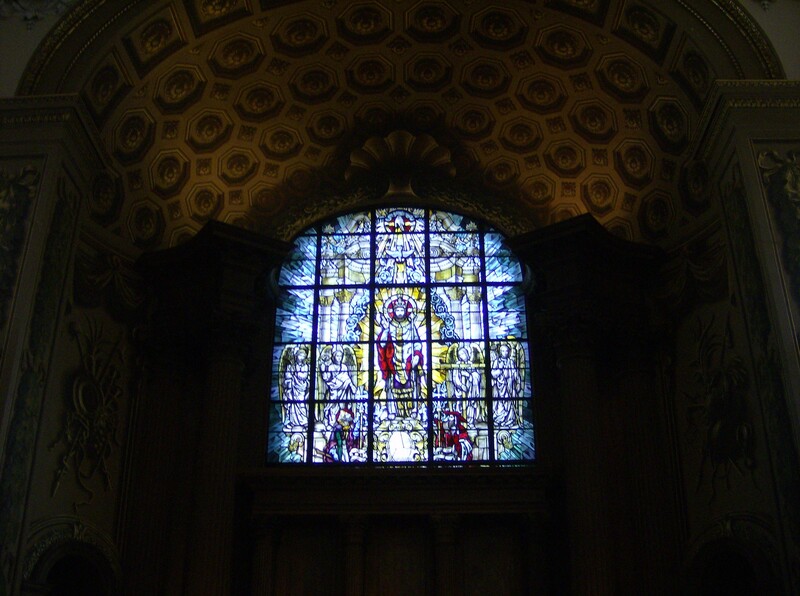 The church interior was also unique, but it also tied into the Royal Naval College aesthetic- the walls around the altar were painted in exactly the same style as the College’s Painted Hall! I adore the ornate atmosphere and artistic execution of the Painted Hall, and it was rather exciting to see such craftsmanship elsewhere. 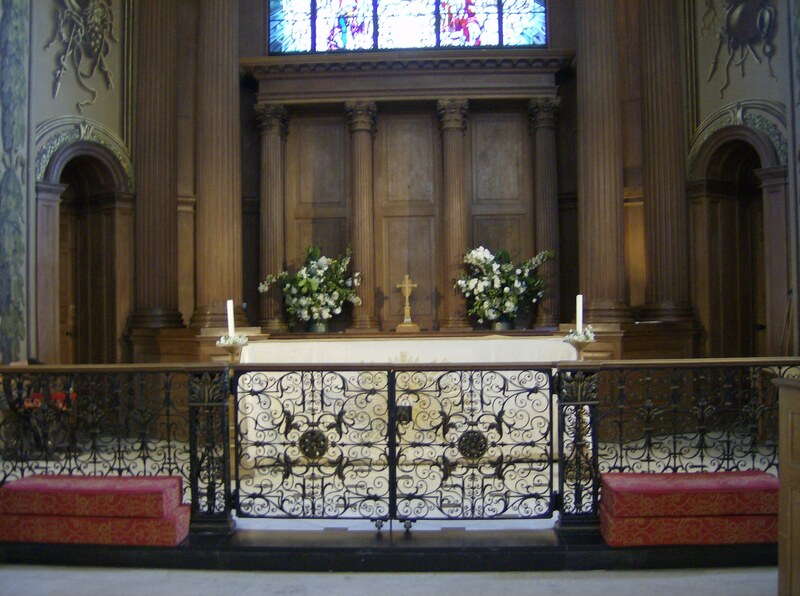 The altar of St. Alfege. Alfege, Archbishop of Canterbury, was apparently martyred here by Danish raiders in 1012. Once I tore my eyes from the beauty of the front of the church, there were two fascinating things to discover towards the back. One was that Major General Wolfe, who died victorious in my home country of Canada, is buried here. 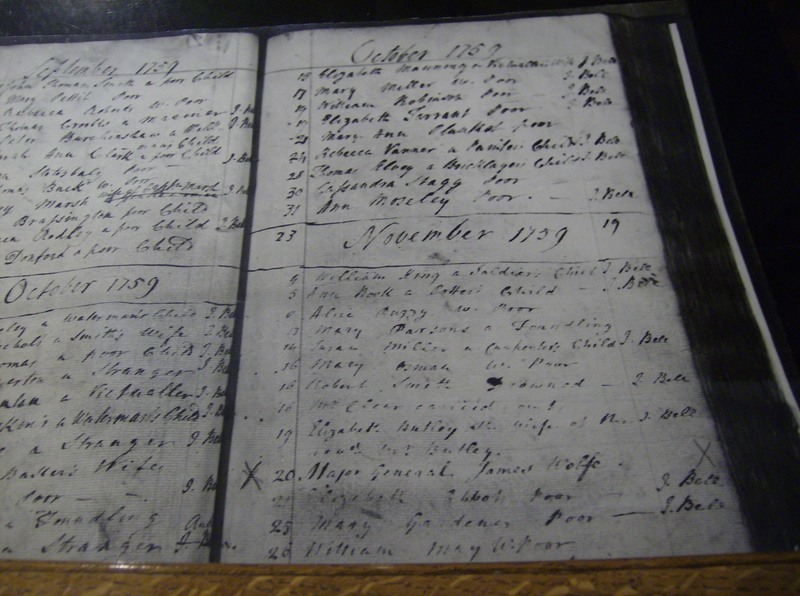 His death is recorded in the church register. 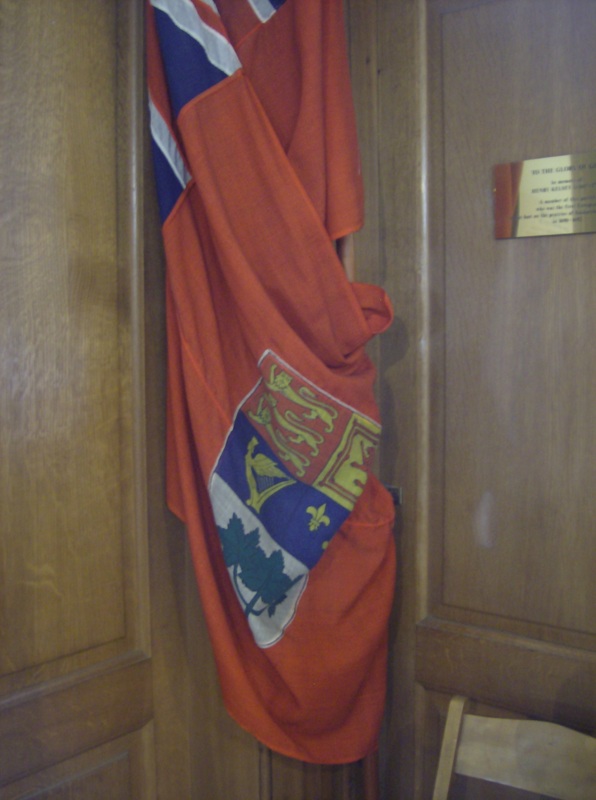 Another sight was a flag in the corner- a Canadian Red Ensign, used from 1921-1957; and presented to commemorate the efforts of Canadian forces in the Great War. 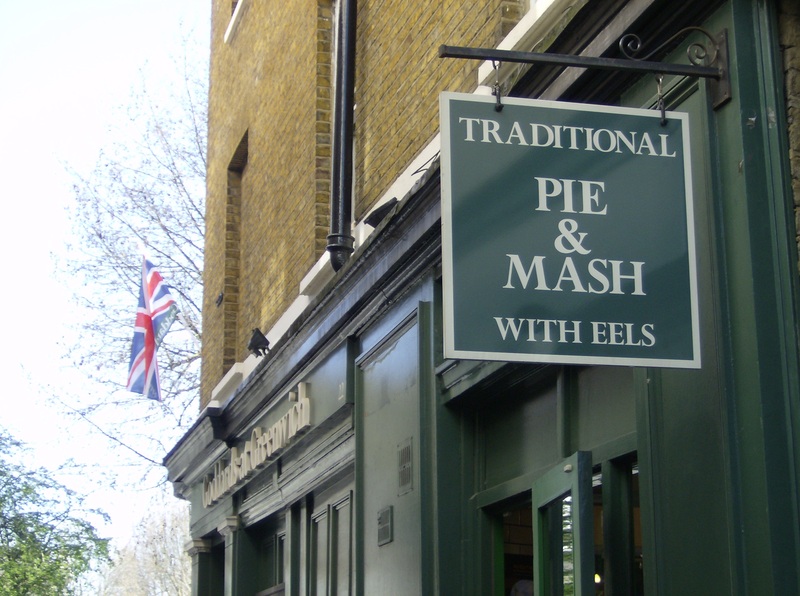 There are memories of the past everywhere in England, and that’s part of what I adore about it. 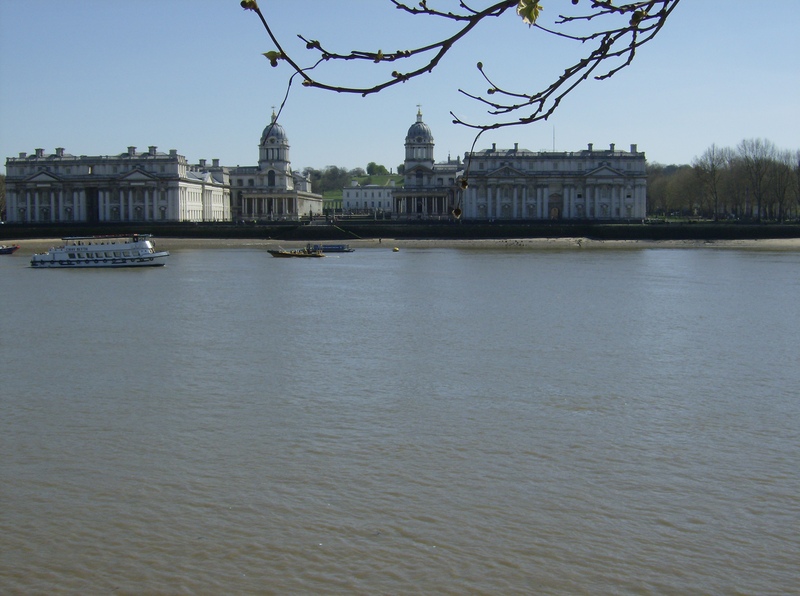 After visiting St. Alfege Church, we went across the river and observed Greenwich as a whole; the College standing resolutely on the riverside and the Royal Observatory behind. 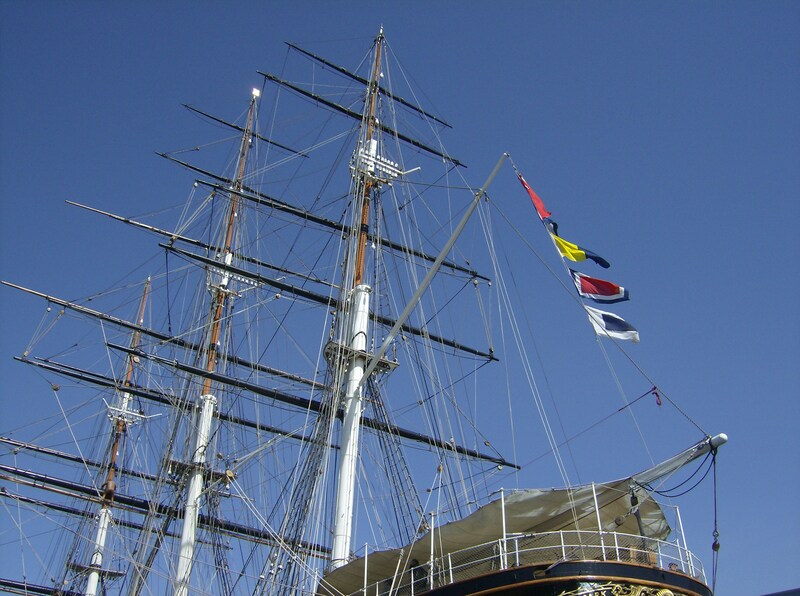 Greenwich is such a beautiful and historical place, and a visit there is the perfect introduction to a vacation in London! 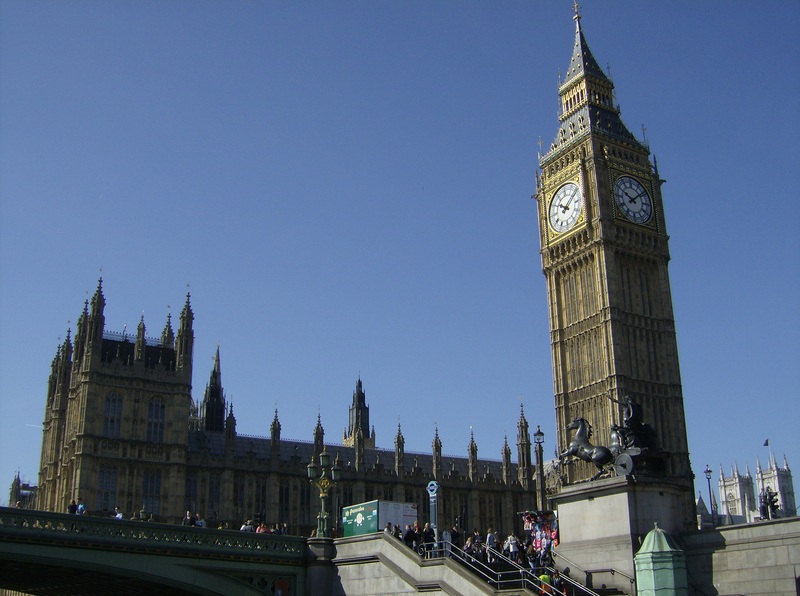 London’s very much on my mind at the moment- after all, I’ll be there in just over two days! This Polyvore set combines my preoccupation with London and something else that takes up a lot of my thoughts: World War II. 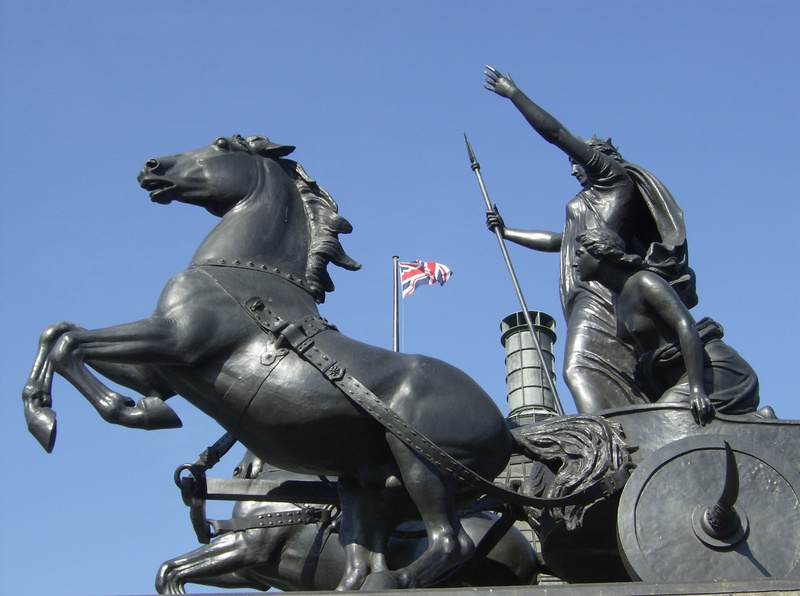 It celebrates the spirit of London during the Blitz; people’s determination to go on with their lives never wavered even as their city was being assaulted from above every night. The key to this look is the businesslike 1940s skirt suit. It exudes confidence and strength, combined with truly authentic style! A burgundy handbag adds a secondary colour to the scheme (and also plays off the colours of the Union flag), and polished jewellery reminds that even nightly bombing raids are no excuse to go out looking shabby! Ladylike touches, which were never forgotten in the ’40s, are introduced through the attractive shoes and the hat. The ensemble is finished with a smart pair of driving gloves, and some red lipstick and nail polish. I feel that this outfit embodies the spirit of wartime London; and I think that this spirit hasn’t been totally forgotten in modern-day London either. 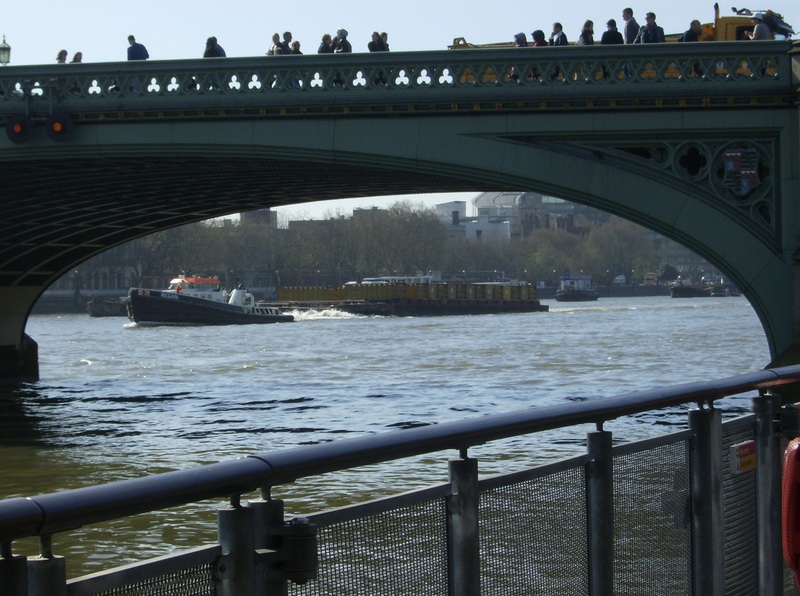 Londoners continue to soldier on with their daily lives; in the face of nonstop rain, irritating and omnipresent roadworks, or even true tragedy. 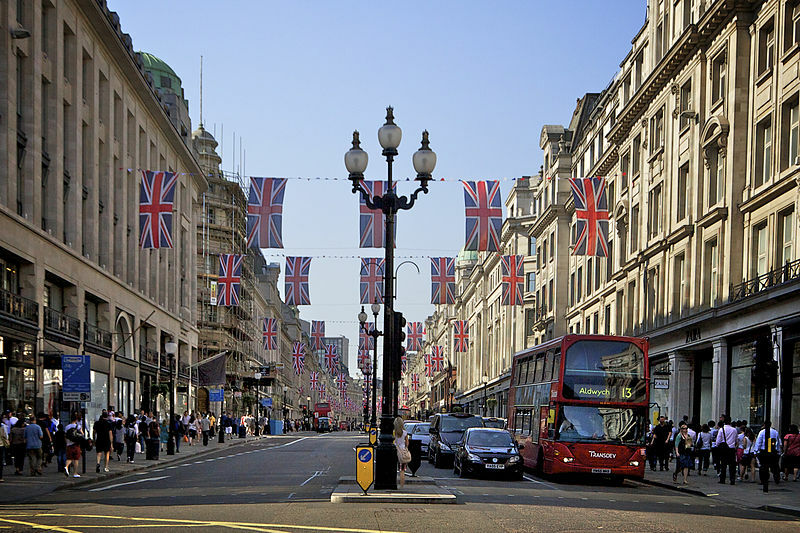 Long live the London spirit! 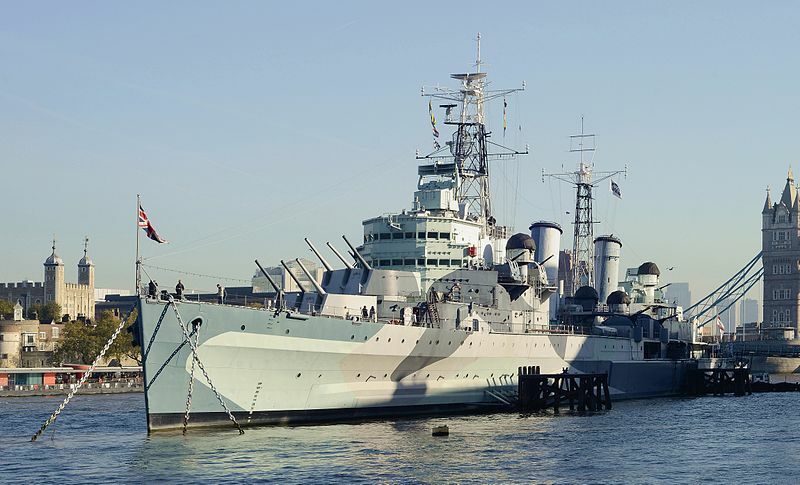 The HMS Belfast is going to be awesome! I’ve been past it so many times, both on land and by river, and I’m delighted that finally I’m about to tour it. 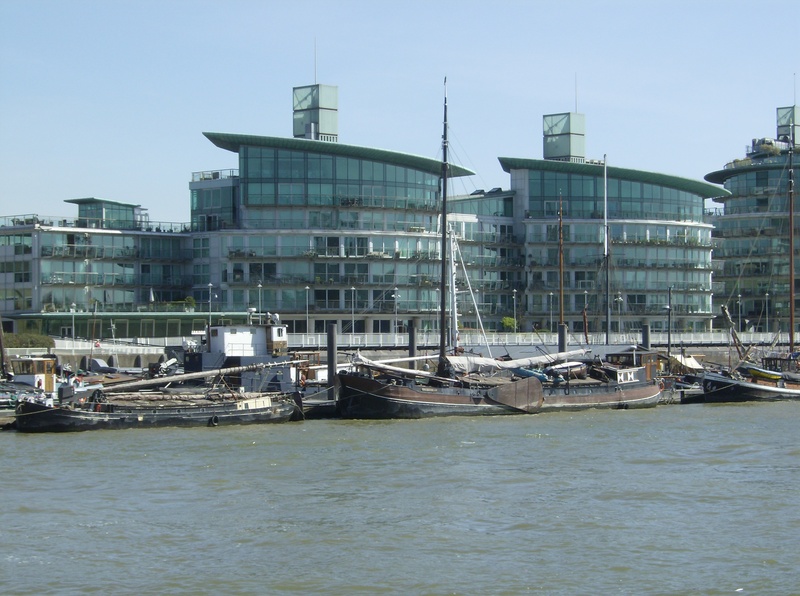 I’ve heard great things about the ship’s museum experience, but it has enough history that it could be an empty shell and I’d still have a brilliant time! 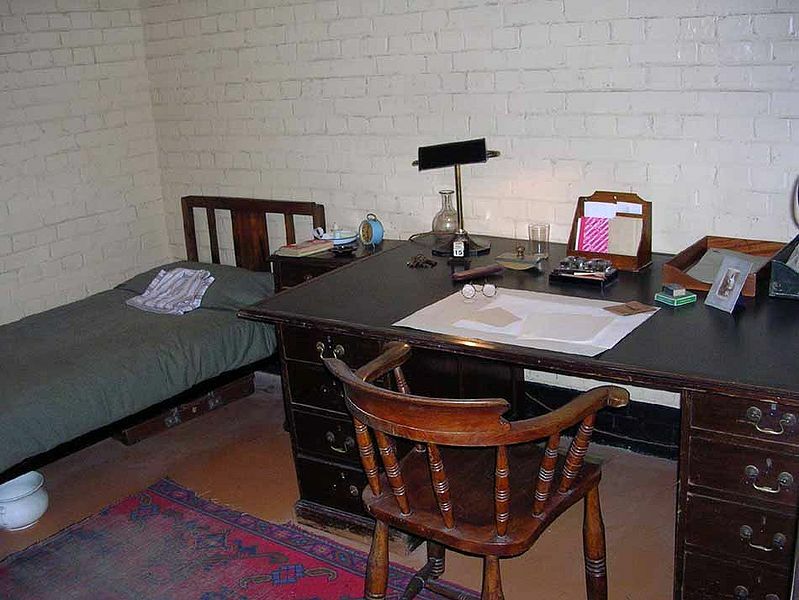 Built beneath Whitehall for both secrecy and safety, the Cabinet War Rooms are another attraction I’ve always been aware of yet never visited. Now with my intense interest in World War II, it’s the perfect time for me to see them! If you work behind the bar of a pub in or around central London, then chances are you may see me next week! I have a detailed list of pubs I want to visit, and I’m sure that many unplanned stops will also occur. 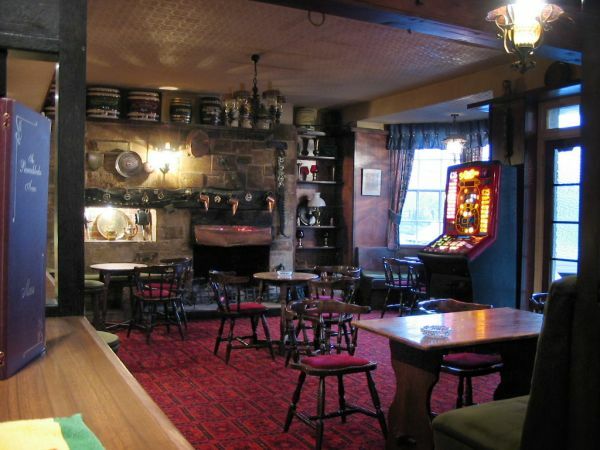 There’s nothing more comforting and welcoming than a good pub, and I think that the friendly pub atmosphere might even convince my mum to have a pint or two! We’ll see about that, though… well, as long as I get a pint, I’ll be happy! 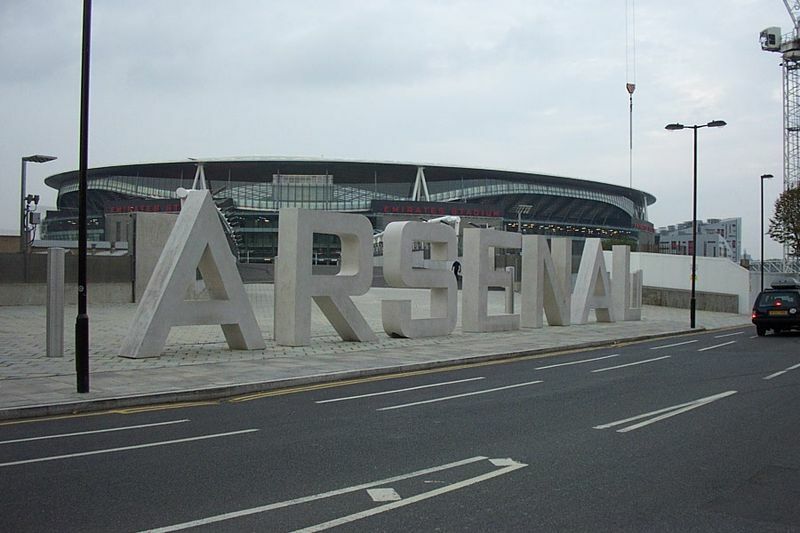 No, I’m not going to Dubai- I’m going to Arsenal’s home ground instead! Not inside, mind you; even self-guided tours of the Emirates Stadium cost £20 and as much as I love Arsenal, I’m not about to spend £20 just to see a dressing room and walk onto a pitch. I can’t wait to just see the stadium, though! 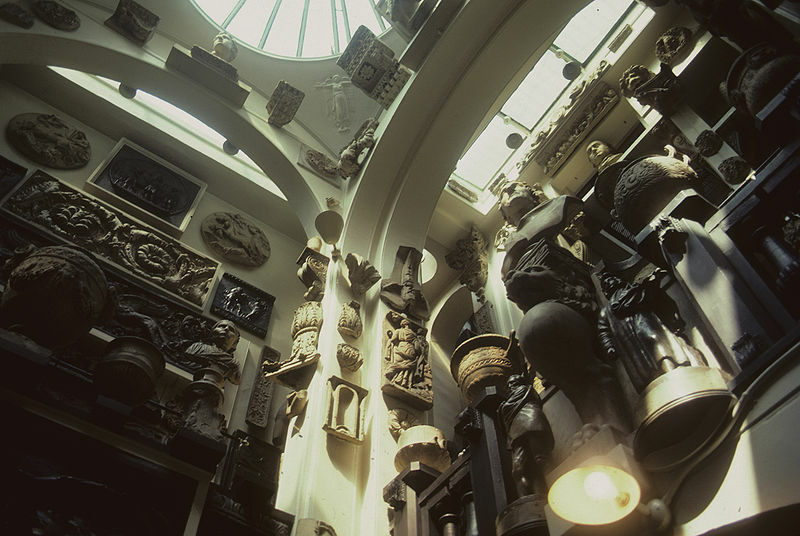 I love collecting and accumulating things, so I think this museum will really speak to me. It’s also going to be fascinating to get a glimpse of not only Georgian life, but of artifacts from the Middle Ages and earlier as well. Thanks to a fortuitous temporary job, at which I’ve been working nearly full-time and which pays much more dependably than writing does for the moment, I actually have a decent amount of money to spend in London! I’m not kidding myself that I’ll be able to afford anything from Burberry or Victoria Beckham, but I’ll certainly browse the high street and secondhand shops as well. I can’t wait to see what I’ll find! 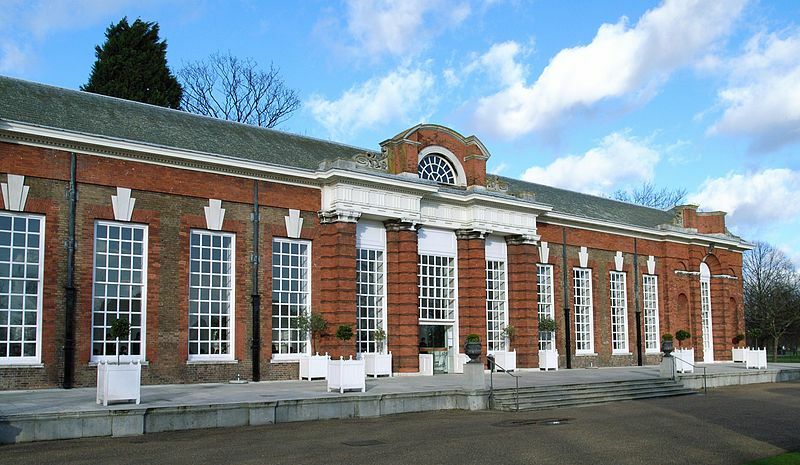 This will be a real treat- my mum and I are going to have afternoon tea at Kensington Palace’s Orangery! This is a very posh place indeed, and it will be so wonderful to have tea in the middle of Kensington Gardens in springtime! While I’m away, I won’t be posting anything- but I promise I will make up for it once I get back! There’s so much I’m excited about doing in London, and I’m really looking forward to posting about it all once I’m home. I hope you’ll stay tuned! No, it’s not winter anymore- but on March 19 it was, and on March 19 I spent the night outside. It was -10° Celsius that night and a little breezy, and there was still no shortage of snow on the ground; leftover from what was a very enthusiastic winter. I should say, this event wasn’t a mistake; I did it by choice, and I feel I had valid reason for doing it! As a writer, it’s my duty to be well-informed about my subjects; along these lines, one of Mark Twain’s most famous quotes is write what you know. And although I’m not about to join the army in order to conduct research for my work, I do like to do as much as I can to understand the lives and plight of my characters. My next novel, which I hope to begin writing before the year is up, deals with Soviet soldiers in the winter of 1941-42– and so, I decided that sleeping outside in the winter would be a wonderful way to put myself in their shoes! My family was skeptical about my plan- in fact, my brother even suggested placing bets on how long I would last outside. But I was determined, and when I get something into my head it won’t easily leave! 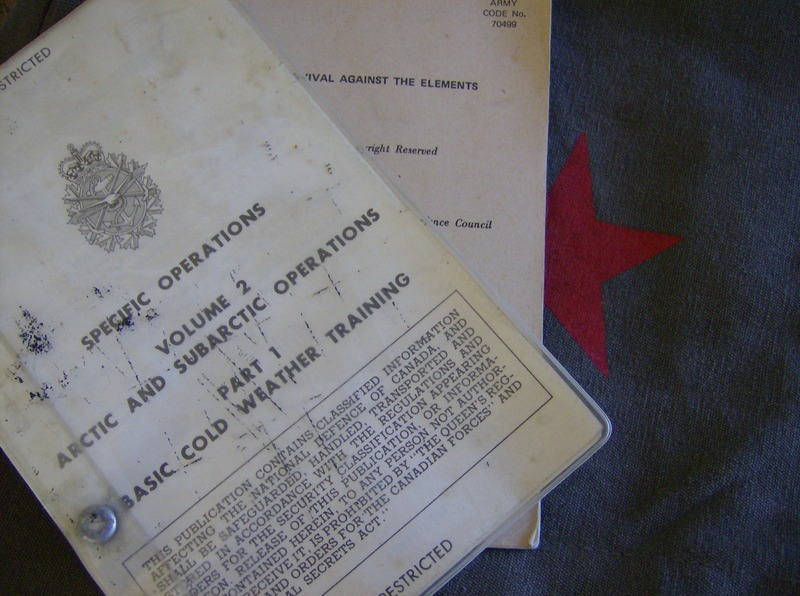 Throughout my preparations (as well as during the frigid night), I kept telling myself that if both German and Soviet soldiers could endure combat in temperatures worse than this, then I could certainly manage one night. I made sure that my preparations were extensive, although I also saw that my supplies and surroundings were nowhere near luxurious. I wasn’t looking to have an enjoyable night, just an enriching one. 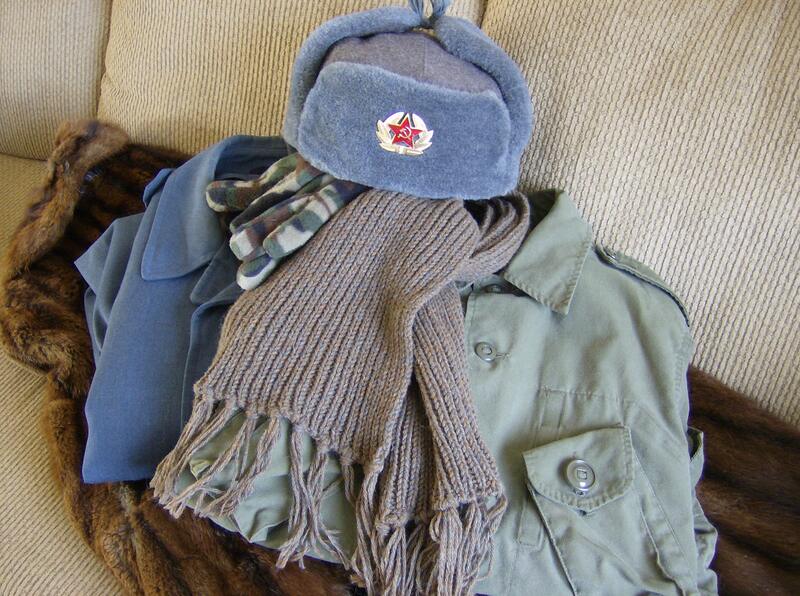 So I gathered my ushanka, an old RCAF coat, a Canadian field shirt, and my grandmother’s muskrat coat; these things seemed warm enough but also authentic enough for my ordeal. I also prepared by doing some reading- last year at a British expat event, of all things, I picked up two vintage military survival books! One is from the British Ministry of Defence, and the other is a much more specific arctic survival book from the Canadian Forces in the 1970s. There’s a notice on the front of the latter that its information is restricted and classified- well, formerly restricted and classified now! 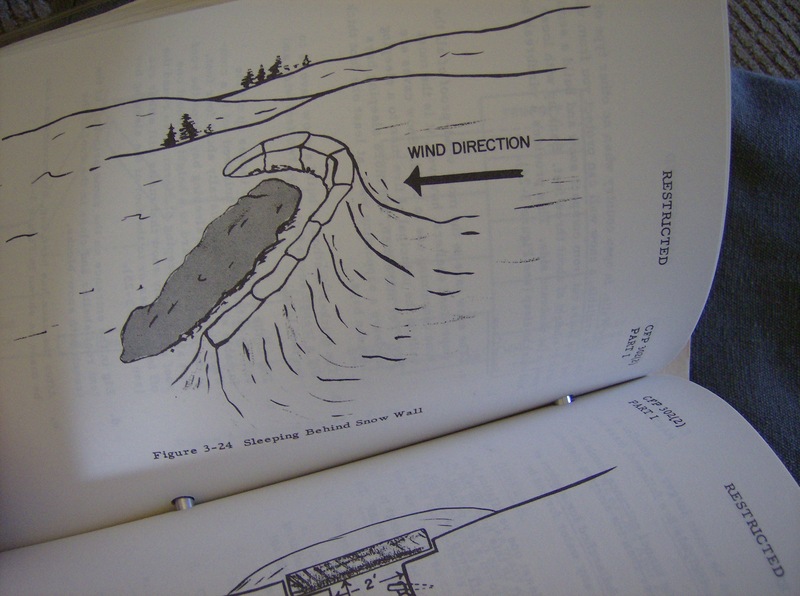 In these books I found lots of valuable information on how to construct and choose shelters and how to remain healthy and avoid frostbite and hypothermia in cold temperatures. I’ve had hypothermia before, and I didn’t want to repeat that! 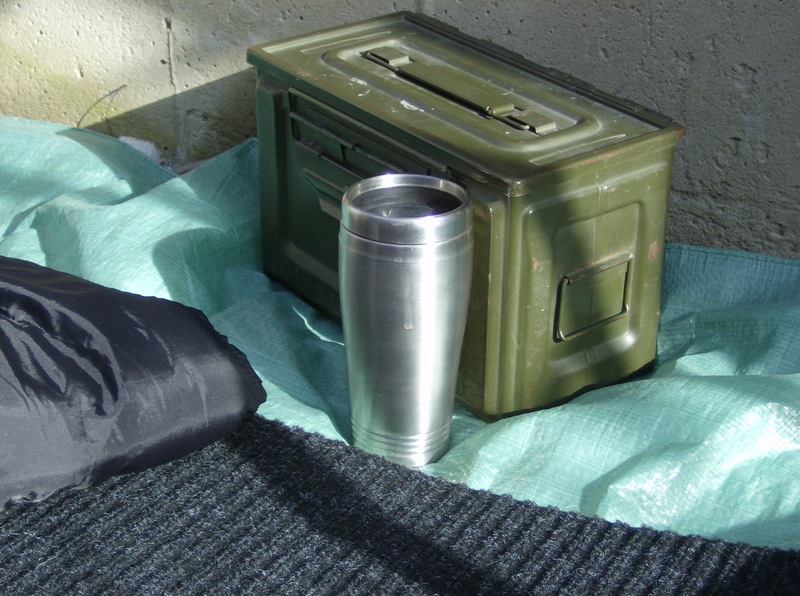 Before the light had all vanished, I filled an ammo box with some survival supplies (like a flashlight and multitool, just to be safe); and filled a thermos with hot tea. Tea was always enjoyed by Soviet soldiers in the field and at home, and I knew it would be a comfort to me during my freezing night. Using knowledge of natural shelter and wind direction gleaned from my survival books, I made camp at the side of my house. I hoped that the concrete foundation would offer some ambient heat leftover from the afternoon sun, and that the wind wouldn’t be so fierce there. My camp consisted of a tarp on top of some hard, ridged snow; a carpet; a lumpy old sleeping bag; a wool blanket, and the aforementioned muskrat coat. 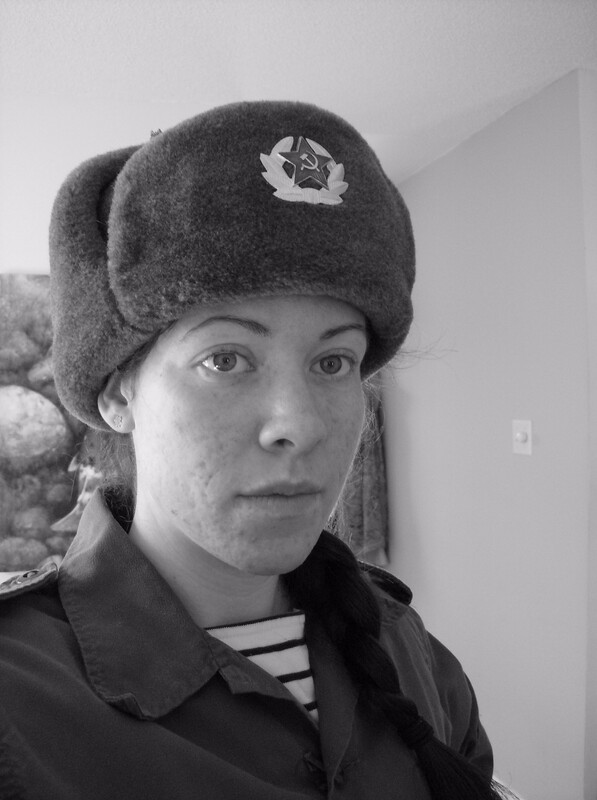 I felt a little unhappy that it was likely more than Red Army soldiers had at the worst of times, but I must say I needed it! However, I did refuse the suggestion of a tent. With all that in place, I began my ordeal at about 10:30; feeling quite eager and not at all apprehensive- even though I feel the cold quite keenly! As soon as I was in my sleeping bag, looking up at the clear sky, I felt such an atmosphere of peace. There was one star right above me, and everything was quiet- I do live on a very small street, but this was really quiet! I thought about my novels and my characters as I fell asleep, and at the start I was nice and warm. 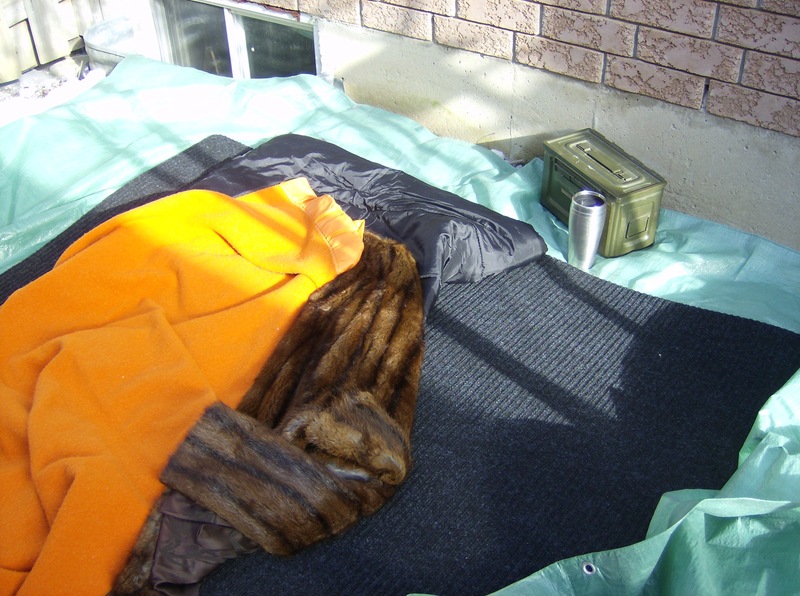 But after about an hour I was awakened by the sound of the tarp rustling in the brisk wind, and I began to feel the cold. The wool blanket and muskrat coat were a blessing, but it was the frozen ground beneath me that was the problem. The cold soon seeped right into my back, and the rest of the night was almost sleepless and very unpleasant. But at least I had things to think about- mainly, I commiserated with those soldiers from long ago; and rued the thought of putting my characters into such nasty conditions! A strange thing to note was that, in the cold, my knees began to hurt. I have bad knees from years of ice hockey, and they quickly started to ache and throb during the night. It made the experience that much more uncomfortable! By 04:00, I was restless and wished the night could be over! I knew I was never going to get back to sleep, but I decided to wait until 05:00 anyway- 05:00 was generally when the Red Army day began. Finally it came, and I trudged inside with a shivery gait; deeply uncomfortable but also incredibly satisfied. And that was my winter ordeal! Once my family was awake, I told them with pride how well I had lasted; and I have a new appreciation and understanding for the Soviet soldier’s life in World War II. Although everyone now thinks I’m crazy, it’s worth it; and although I was colder than I’ve been for years, that was worth it too. With this crazy yet fulfilling experience behind me, I can’t wait to get started on my next book! 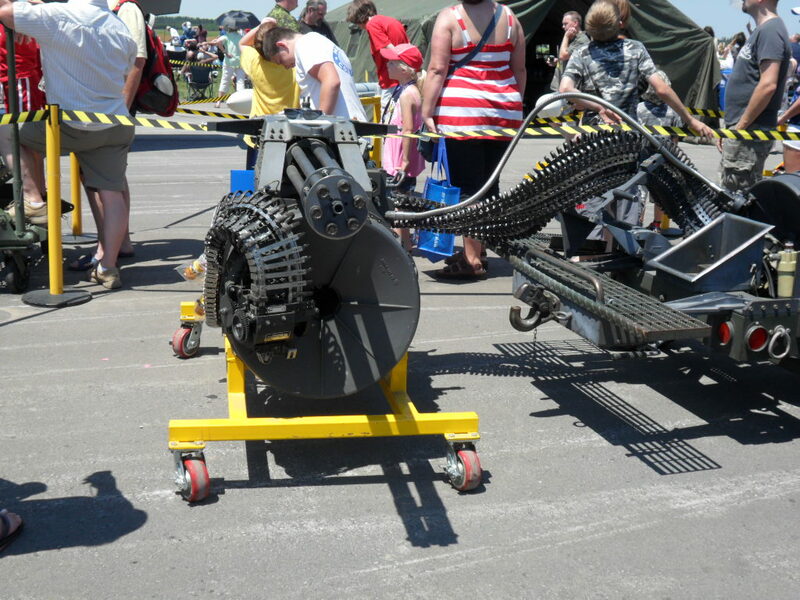 At the 2012 Borden Airshow, amazing aircraft weren’t only found in the skies. 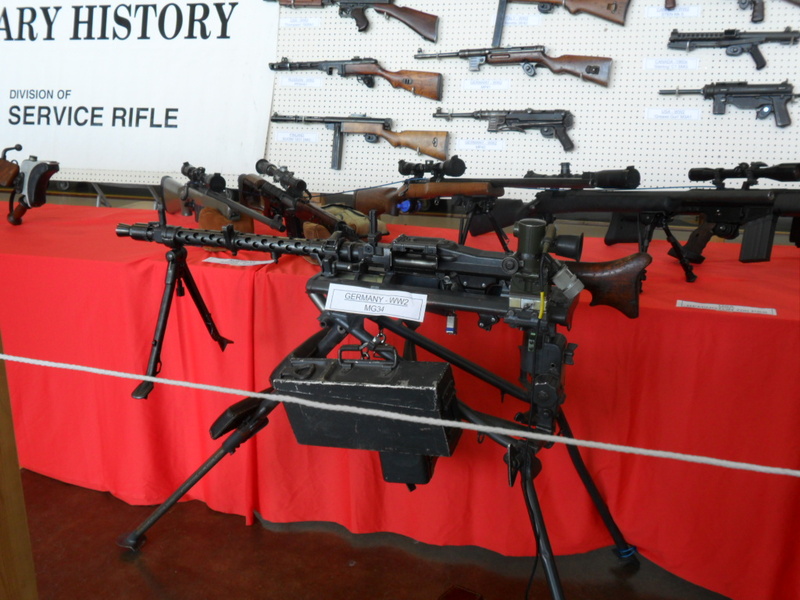 There were also extensive static displays of airplanes, weapons systems, firearms, and army vehicles on the ground! 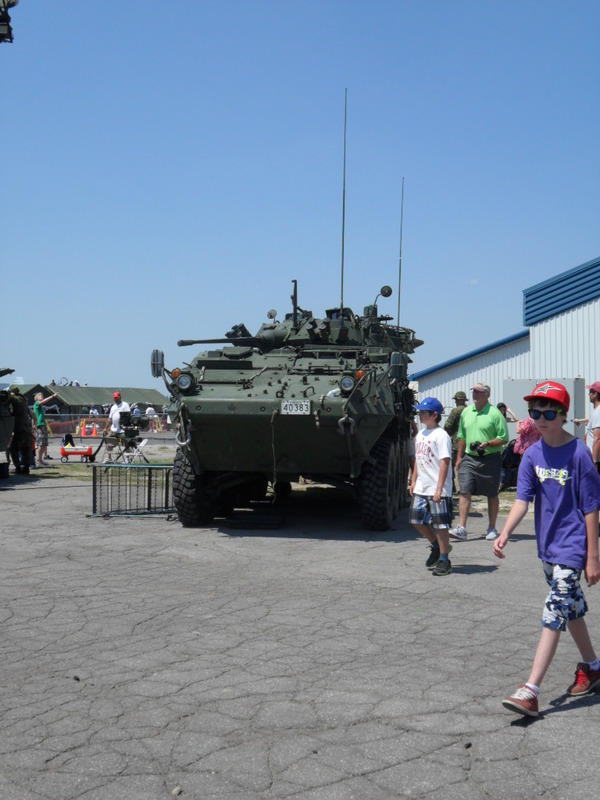 It was a dream come true for me to see so many military things in one place; in 2012 I was still newly enthusiastic about military things, and I could not have enjoyed the Borden Airshow any more. 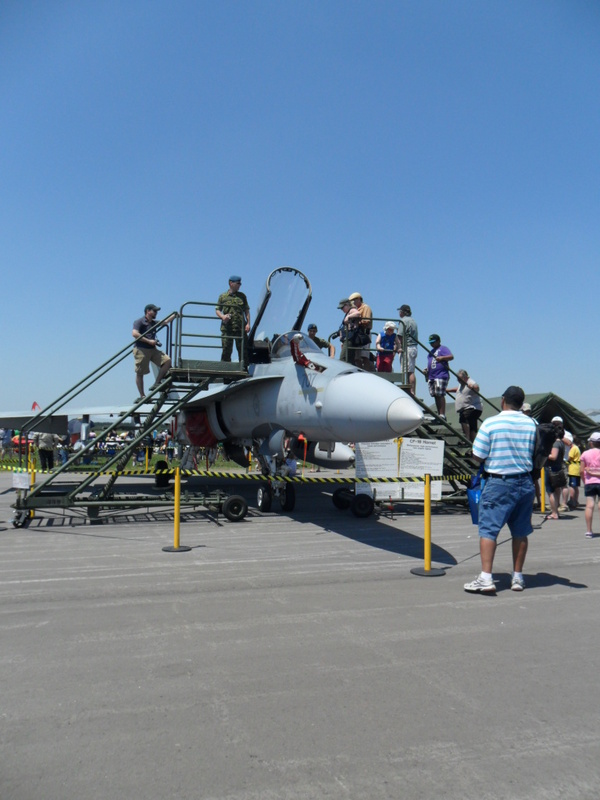 A CF-18 Hornet, with its cockpit open to visitors! I sat in it for as long as I dared due to the long queue, and it was awesome!! As an aerobatic plane performed overhead, I browsed the static displays. 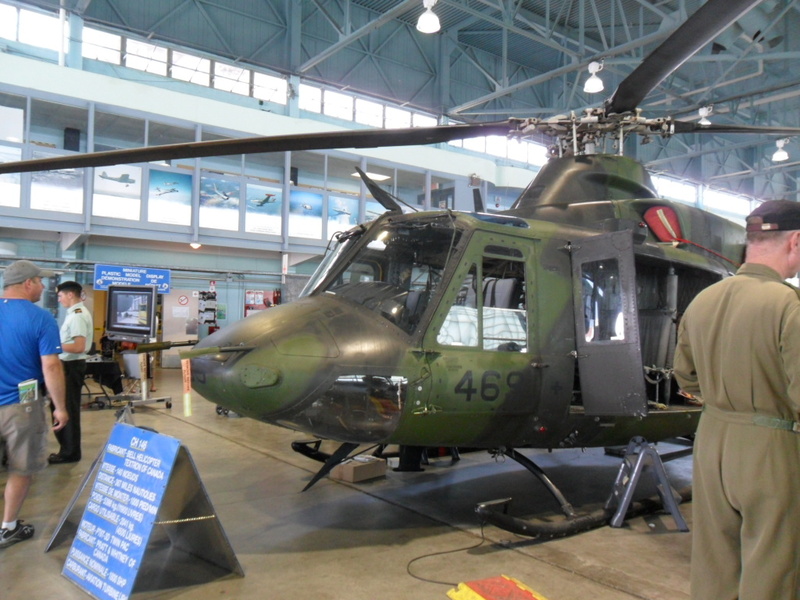 There were numerous old and current RCAF aircraft on display, and this seemed particularly special since Base Borden has been an aviation hub since 1917! 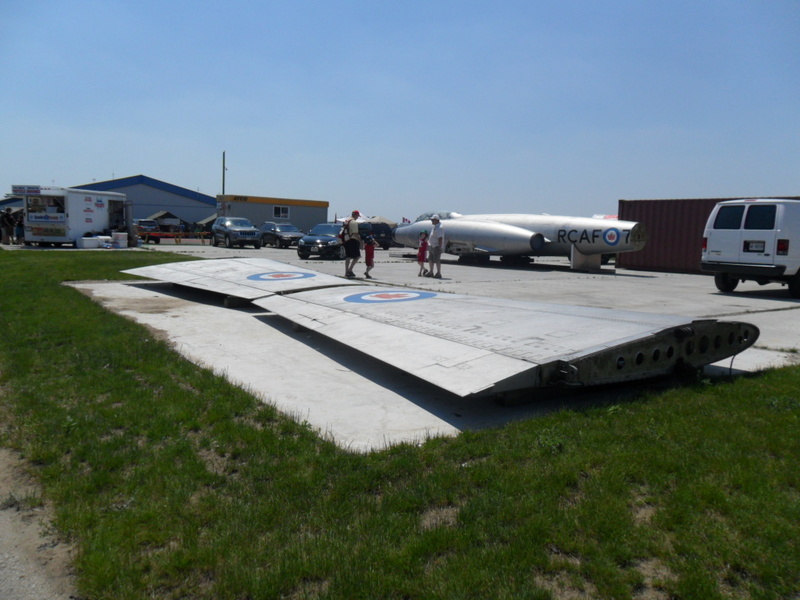 Not far from the static displays, there was some rather sorry evidence of Base Borden’s long history. 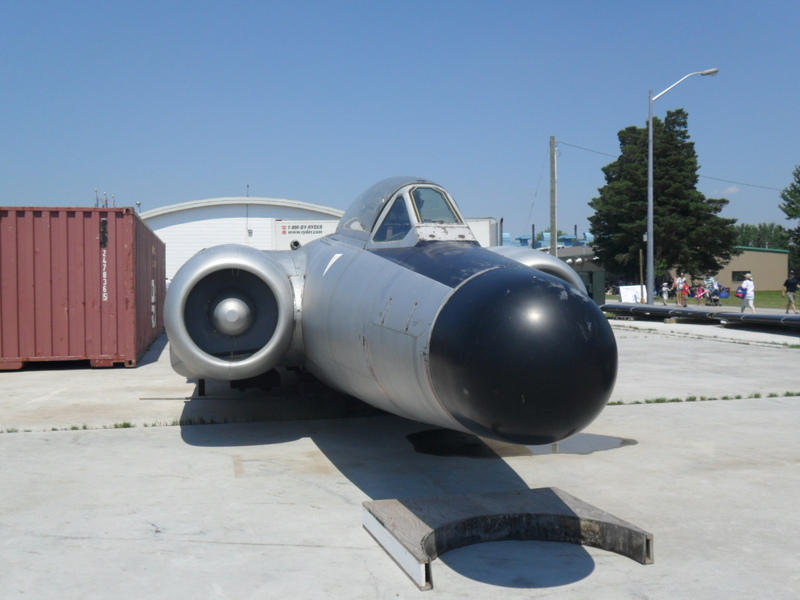 Between some modern buildings, on an otherwise-unused patch of concrete, were the pieces of a CF-100 Canuck. The disemboweled aircraft was just languishing there; and almost three years later, it still is. It’s awfully sad. 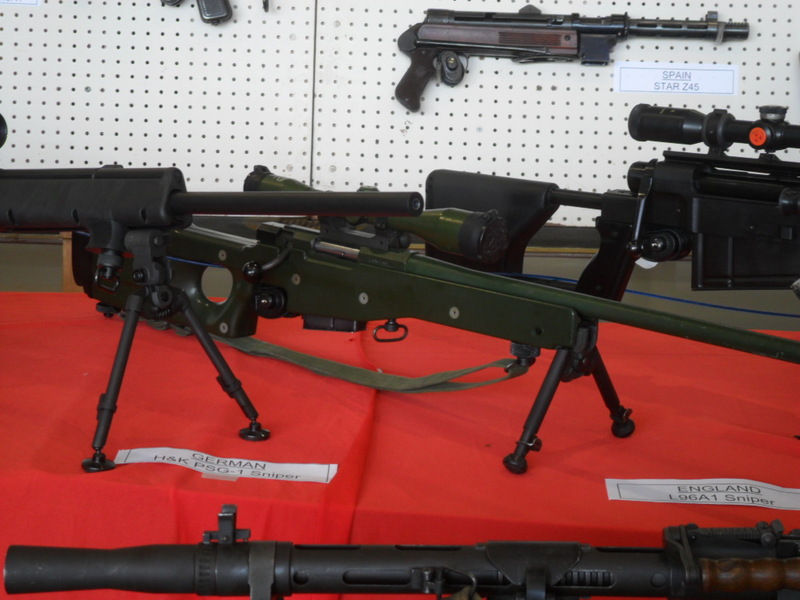 Within sight of the forgotten Canuck was a collection of modern army vehicles and equipment! 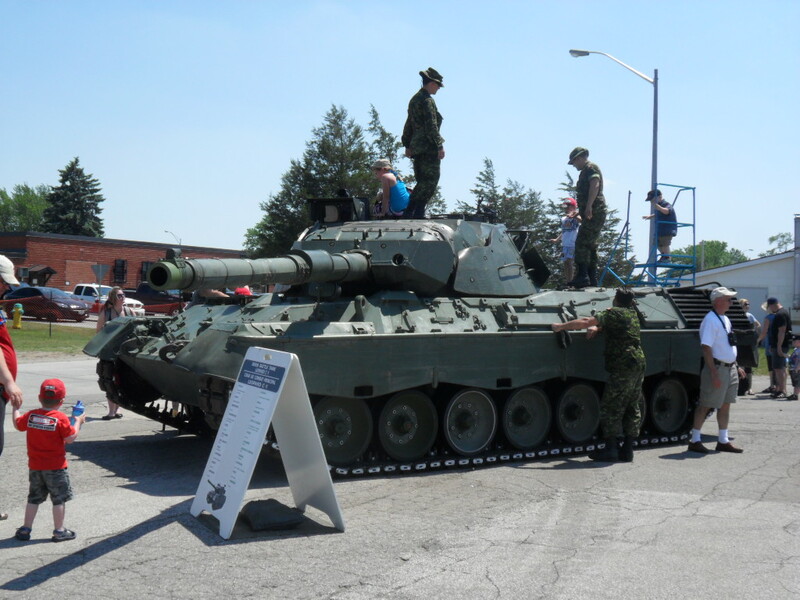 Surrounded by proud military personnel and excited children, this was a much happier sight; and I enjoyed such a close-up look at today’s military vehicles. An enormous gun. I have no idea specifically what it is, but it’s impressive! Once the summer sun became too much to handle and there was a bit of a lull in the proceedings overhead, to the hangars I went! There were lots of information booths on the Canadian Forces, as well as information about the history of Base Borden and the RCAF. Plus there was a CH-146 Griffin! The hangar with the Griffin also had a bunch of aircraft engines and unmounted cannons in it- these seemed to be used for maintenance training at the base. But the next hangar was even cooler. 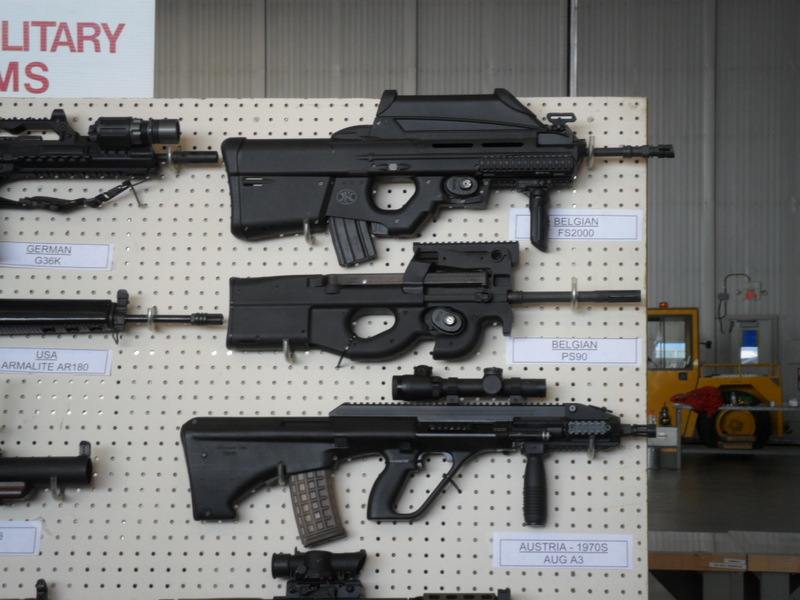 It was full of guns! 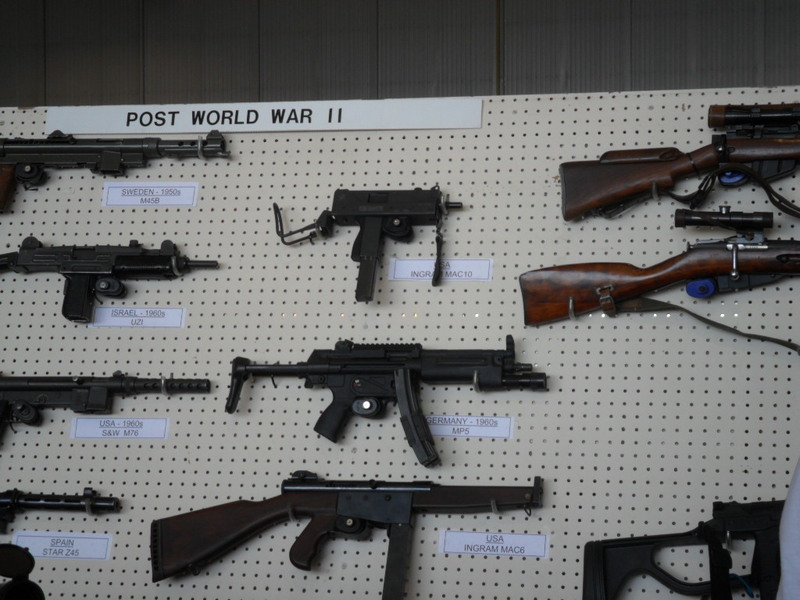 Arranged chronologically, there were guns from all eras and countries; and I gazed open-mouthed for ages at them all! 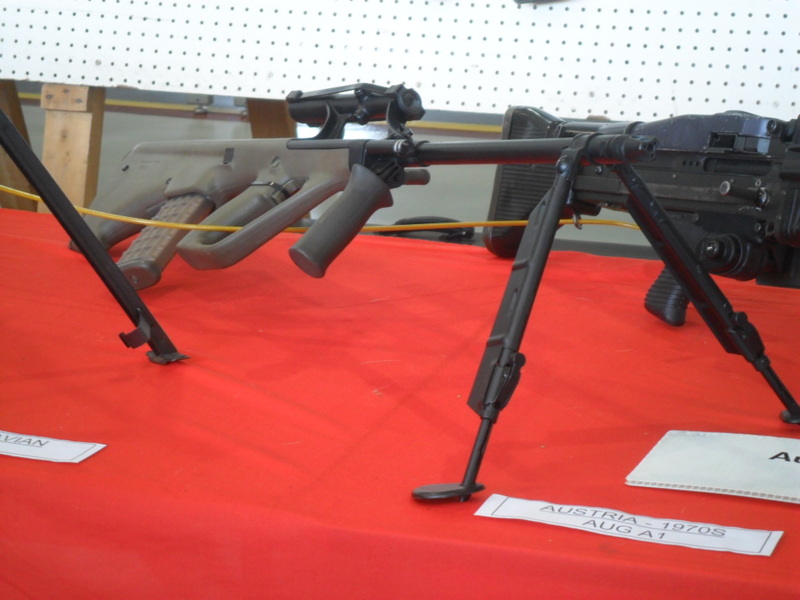 For someone who does a lot of military reading and plays Black Ops on occasion, guns like the L96A1, AUG, and MG-34 seemed exceptionally rare, and like the stuff of legend. They certainly weren’t what I expected to see at a local airshow! 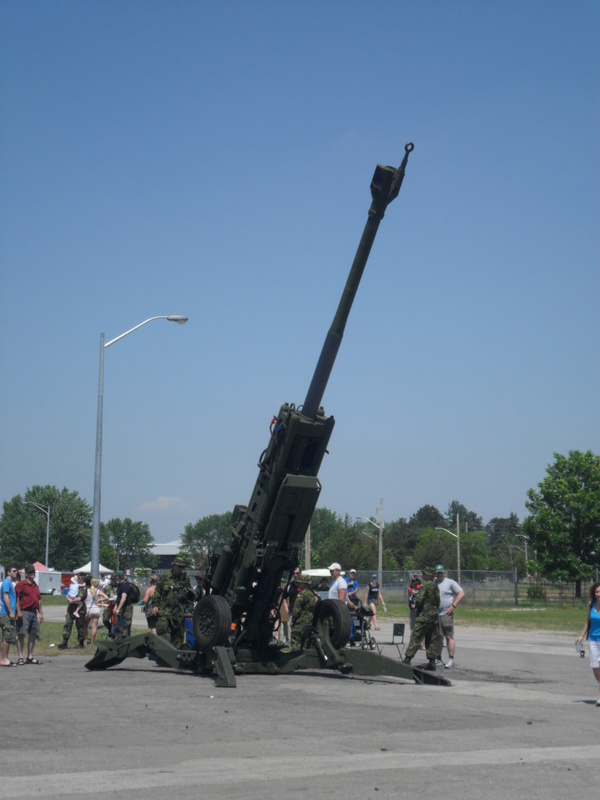 But the Borden airshow is put on with the help of the Base Borden Military Museum, which is well put-together and extensive. 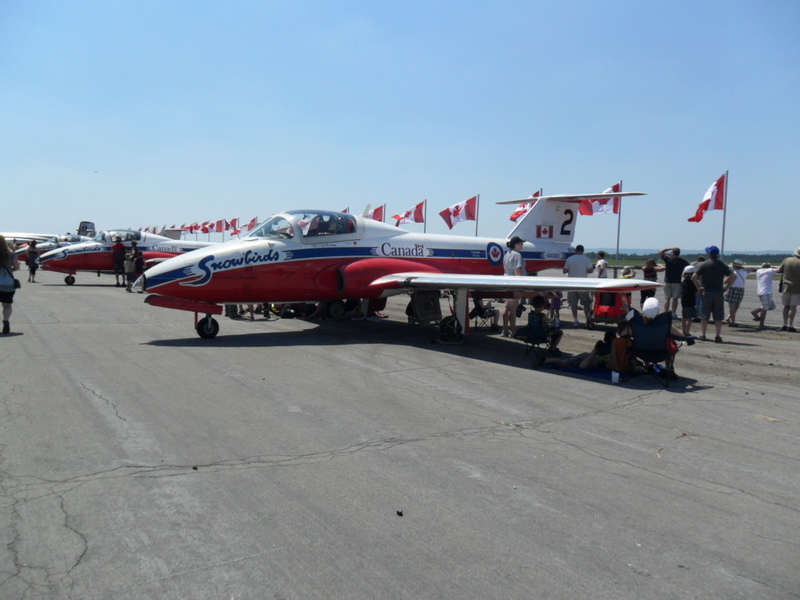 I think the 2012 Borden Airshow will long be something I remember; it was so exciting, and it really inspired and educated me in regards to my writing. Next up is Base Borden’s 100-year anniversary show, and even though it’s still far away I can’t wait for it. It’s sure to be even more amazing than 2012’s show!